My marshall Bluetooth amp just stopped working!! I have tried unpairing and repairing, different devices but it won't play. It connects but won't play. Is there anywhere to send it or take it to have it looked it?! I miss my music! Anyway, please assist in helping me locate a replacement input Jack! Hello, im from Brasil and i have both amps intendet for EU market, 01-E. But the outlet voltage in my country is 127v. I ve switched mains voltage to 110v. I have spected that heater voltage would become higher than 6,3v. But it mettering 5.7v. Both amps have same issue. Why? Does 110v is actually 120v ? Does it happens because these are European models? Hello im from Brazil and my outlet voltage is 127v. Do all exportation 2203x models heve the same mains selector options - 110v, 220v and 230v? What the difference between JCM export models 2203-01-u 2203-01b and 2203-01e? My VSR 65watt is making odd sounds. where is my serial number located I dont see it on the tag on back? I want to ask that is it normal for the jvm410hjs having switch the standby switch to off, the sound of my playing not cutting off instantly? When I operate my DSL 40 C at high gain/ volume or on the clean channel with the crunch engaged, there is a noticeable 'splat', More specifically, on the D string, ninth fret B note ( oddly specific, I know ). Could this sonic anomaly be caused by an inferior/faulty preamp tube? Thoughts? 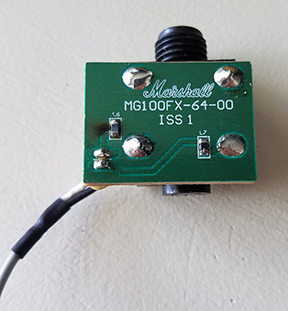 Hi, just bought a Code 25, I'm happy with the unit to a degree, but I have one niggling dought that I may have a faulty unit, it seems to be more noticable on certain guitars, when playing my Tokai strat, on the Bluesbreaker presets( 41,42,43), I get a horrible harch distortion ( as though its overloading the preamp, but ony around the 5 and 7th fret of the G and B strings) this also occours with headphones, if I back off the volume on the guitar it does reduce the distortion. Has anyone else noticed this? When running my Marshall DSL 40 C at high gain/volume, or on clean channel with crunch engaged at higher volumes, there is a noticeable "splat", an odd sonic artifact that occurs--more specifically on the B note, 9th fret, D sting ( Standard tuning ). Could this possibly be a faulty/inferior preamp tube in the V1? Other than that, the amp sounds glorious, performs well, and there are no other issues. Thoughts? How many were produced from the following 50th anniversary limited edition amps? Are there any wheels I can screw to the bottom of my amp to make it easier to maneuver around the room? If not what could you recommend? I tried to instal the Code firmware update utility on my windows 10 PC, and my antivirus keeps blocking it from installing. My question is what is in the update, and is it worth downloading/updating? I just purchased my first Marshall amp. Actually my first amp period. It's an acoustic amp, the AS50D. My question is can I play a non acoustic guitar like a Gibson Les Paul without damaging the circuitry? I am a new player and don't want to take any chances with my equipment. I'm currently experiencing a problem where the amp locks up on a regular basis. When it happens, none of knob (gain/low/mid/high/volume) and button (pre FX/amp/mod/del/etc) settings take any effect: e.g I can set a mod effect, but the sound doesn't change. The amp is paired with my iPad, but when this happens, the iPad is not connected and not even in range. It seems to be related to having the amp connected to my iMac via USB: after frequent cases of this happening, I unplugged the USB cable and the problem instantly went away.